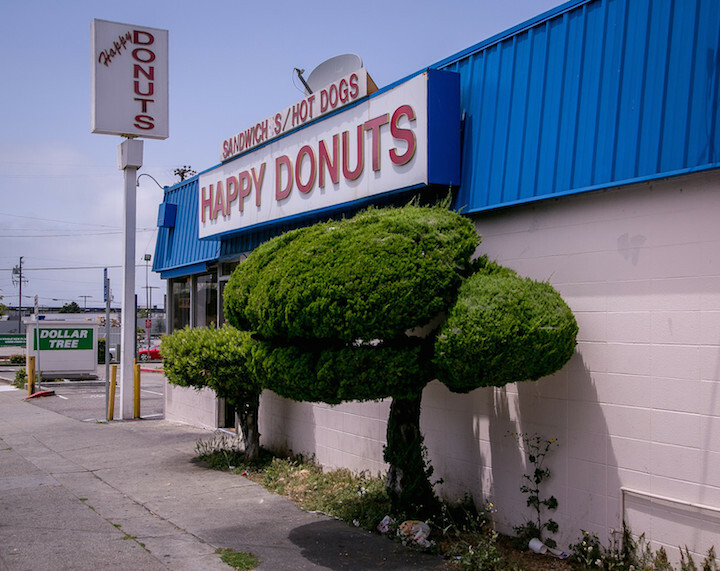 Quirky Berkeley | Architecture – Googie!!!! 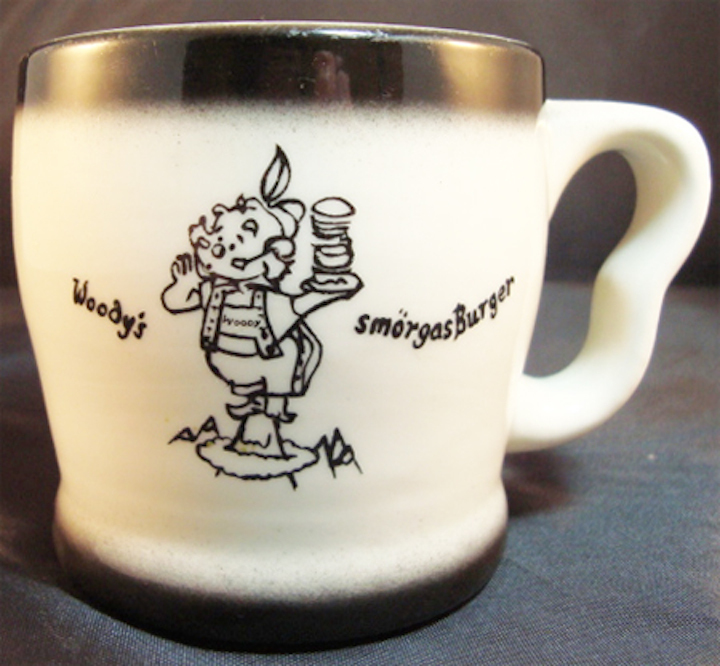 Or – Semi-Googie!!!! 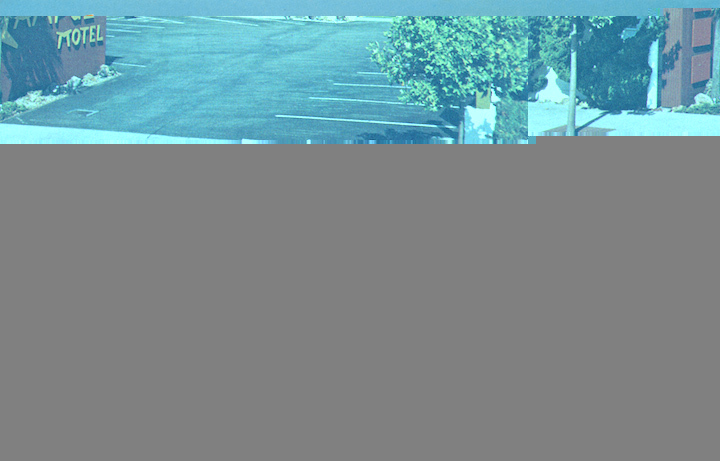 Architecture – Googie!!!! 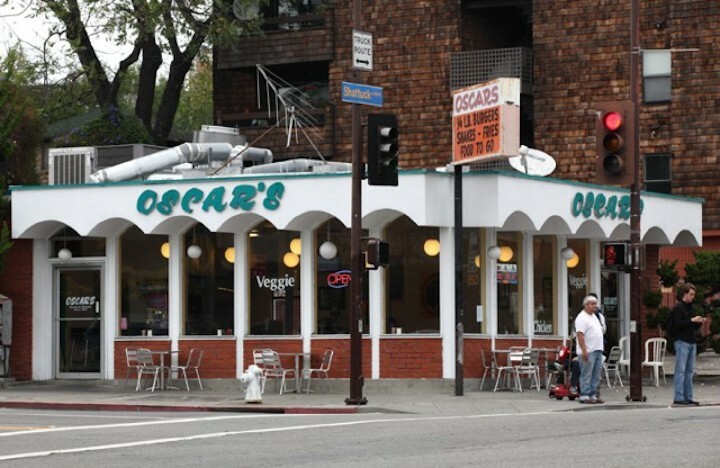 Or – Semi-Googie!!!! 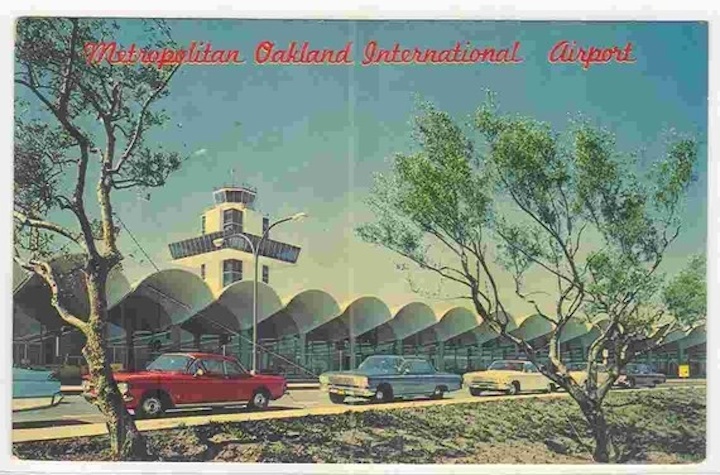 I still cannot define (or even decide) to what extent I will include architecture in my overall vision of what is Quirky Berkeley, but I know that I will include – and am now including – Googie architecture as officially part of the Quirky Berkeley Fabric. I only wish we had more. 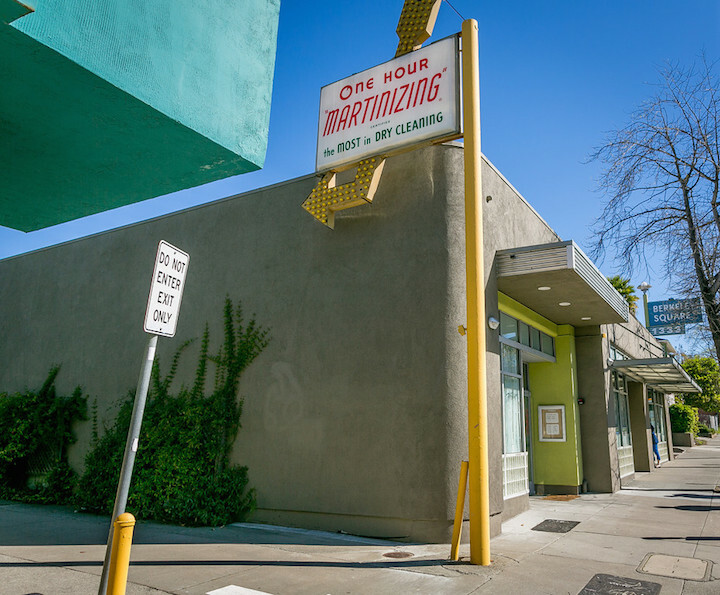 Even if you don’t know the term “Googie,” you know what it is. 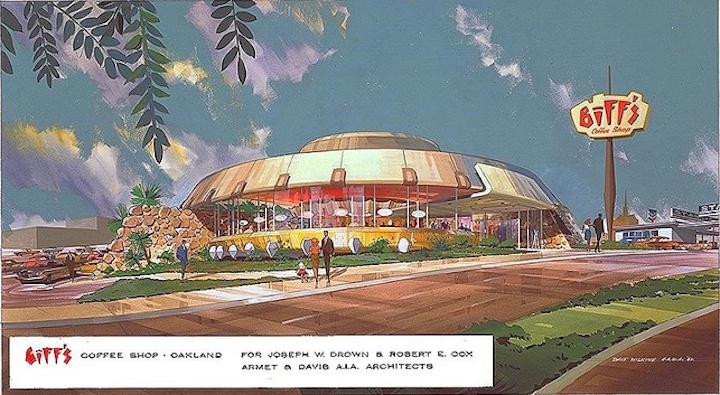 It is crass, kitschy, modernistic, futuristic commercial mid-century architecture. It is also very cool. Glorious even. 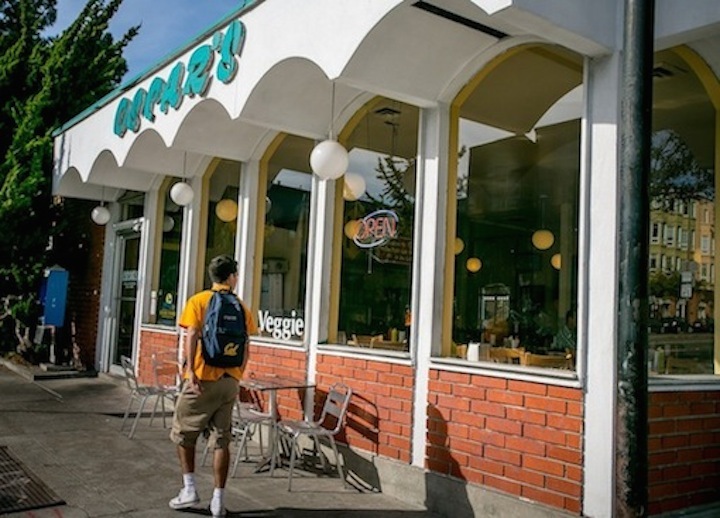 It is also known as Coffee Shop Moderne or late-modern commercial, but Googie is the name that sticks. 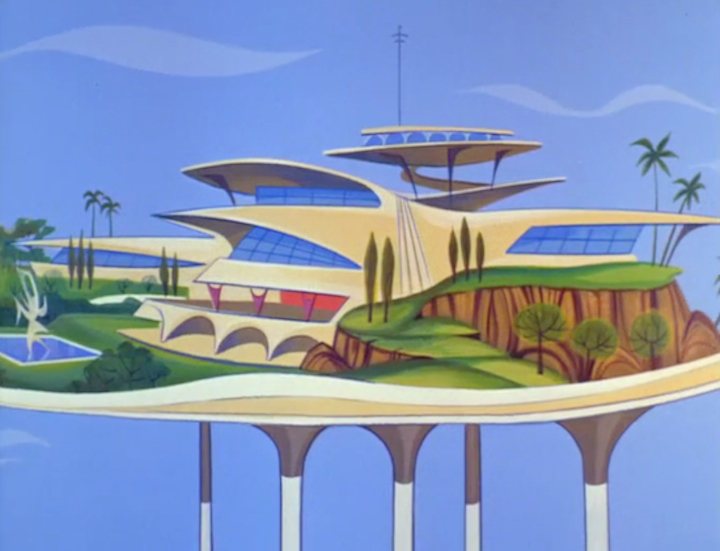 The Jetsons did not come to television until 1962, but the graphic ethos of The Jetsons is pure Googie. 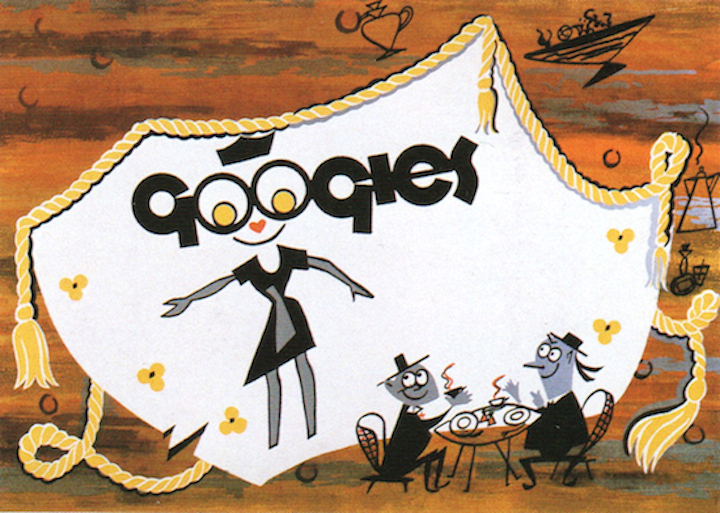 Googie – born in the late 1940s and lasting through the 1960s – features aomebas and boomerangs, stars and atoms and flying saucers, rockets and satellites, dingbats and spiky balls and shining globes bristling with antennae, sphere-and-rod combinations, parabolas, tapered columns and cantilevers, sharp angles and trapezoids and zig-zags and diagonals and tilting roofs. 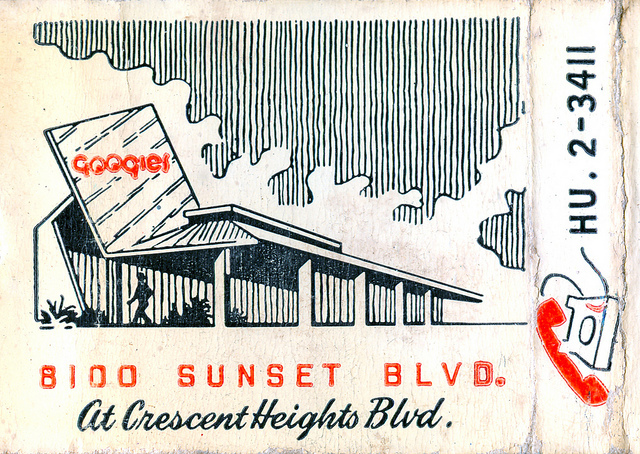 The name “Googie” comes from the long-gone Googie’s coffee shop in Hollywood, designed by John Lautner in 1949. 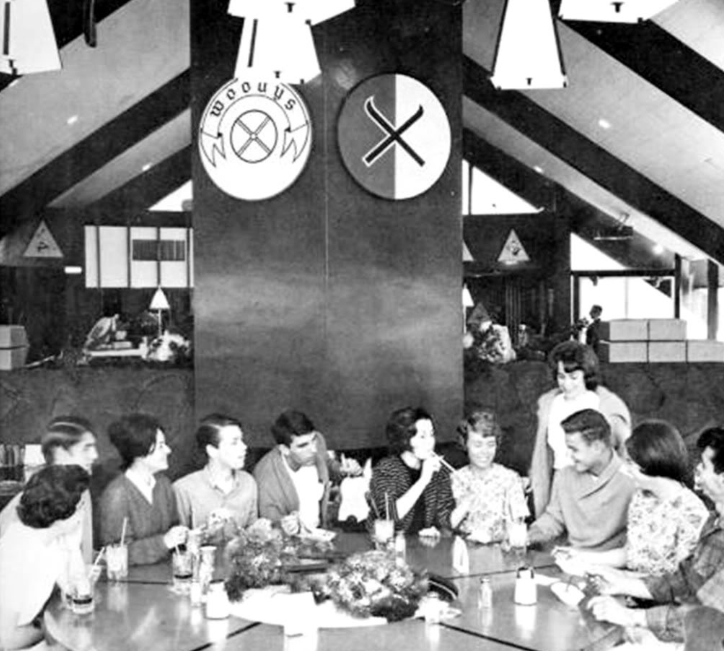 Googie’s was a hangout for Hollywood’s elite and striving. 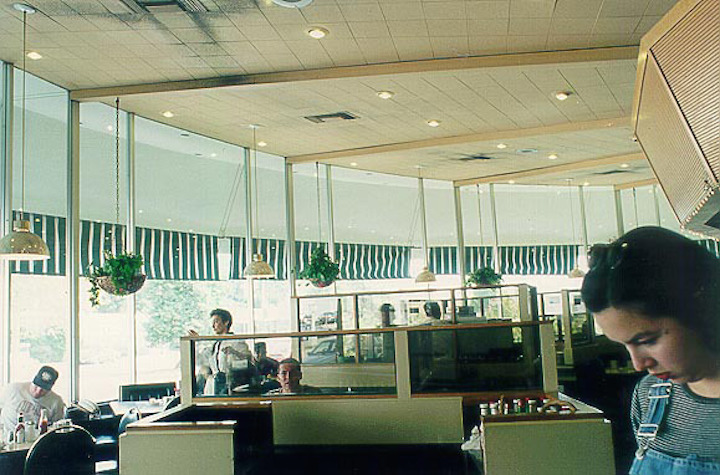 Here are a few gratuitous photos of James Dean at Googie’s, exterior and interior. 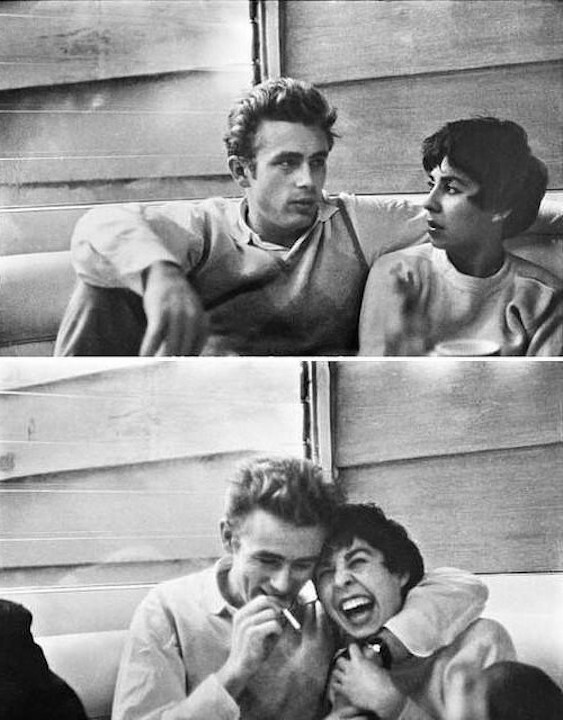 Three months after these photos were taken, James Dean died. So much life there! 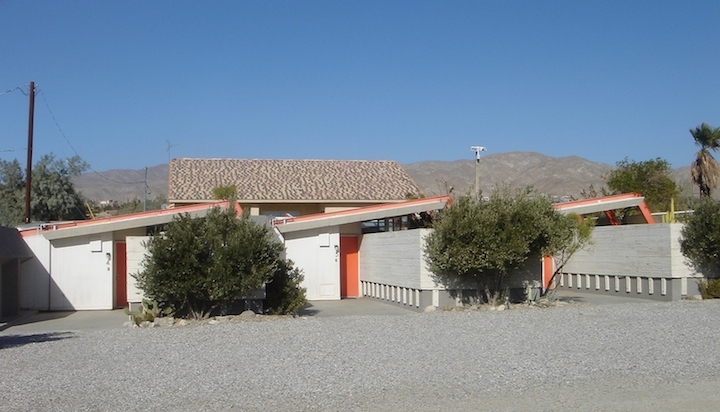 In my many, many 509-mile drives from Salinas to Calexico between 1974 and 1980, I passed many, many times the memorial to Dean in Cholame, near the junction where he died. 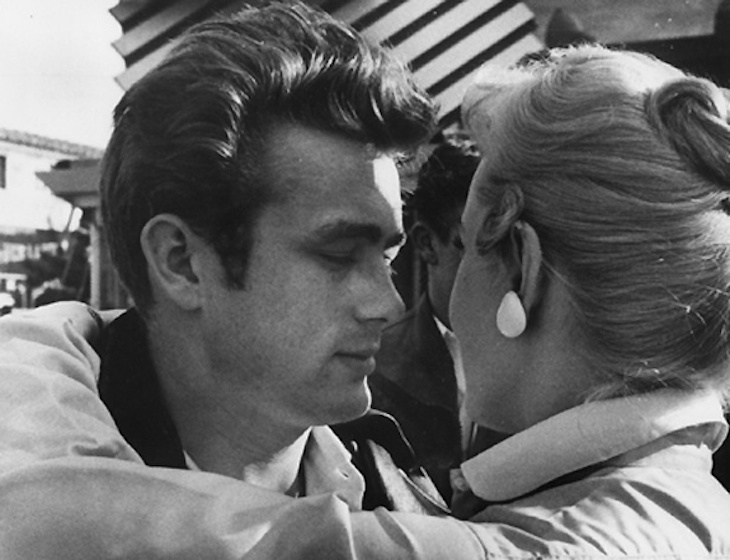 End of James Dean digression. 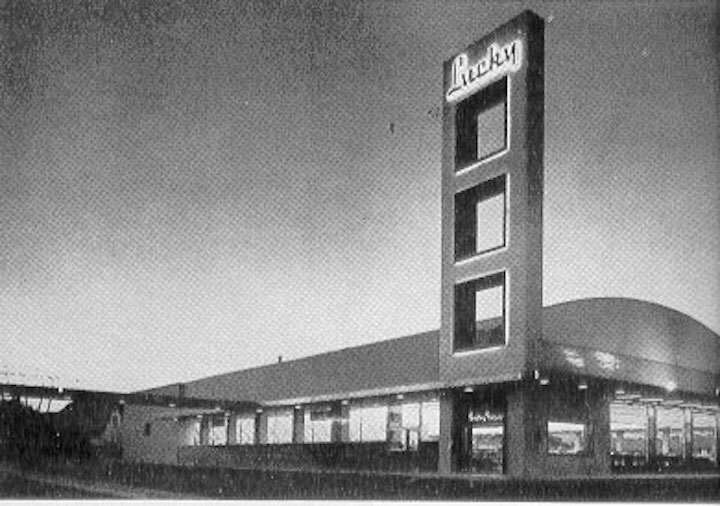 The name “Googie” as applied to the architecture was ironic. 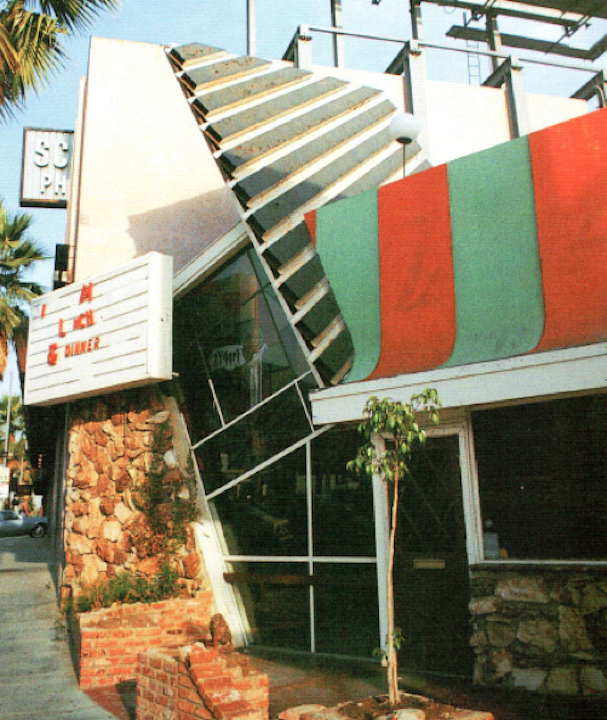 Googie’s Coffee Shop was not John Lautner’s first effort at coffee shop moderne, or architecture that would eventually be known as Googie, and it was certainly not the first example of Googie design. 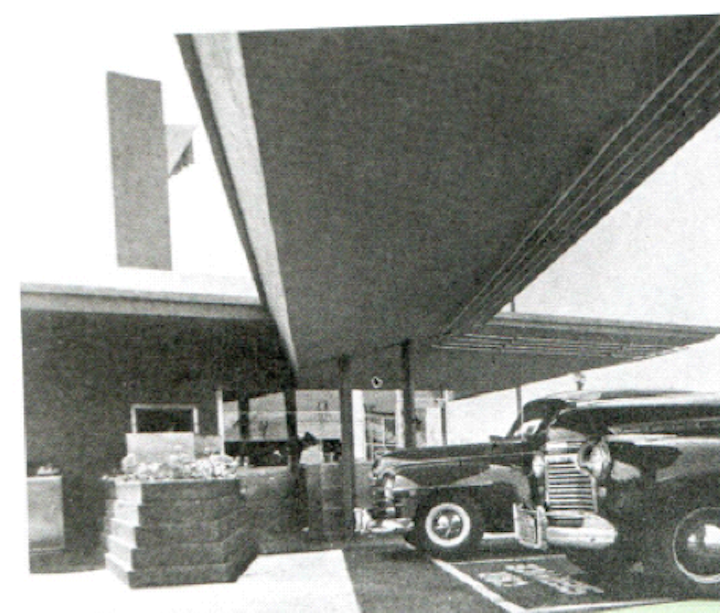 Two earlier Lautner projects scream “Googie,” the Desert Hot Springs Motel and Henry’s Drive-In in Glendale. 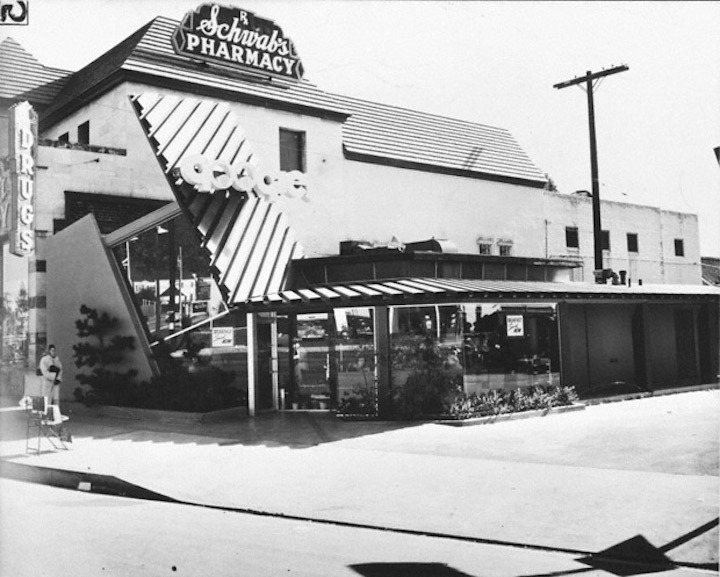 It was pure serendpity that that architectural historian and critic Douglas Haskell latched upon Googie’s coffee shop as the archetype and eponym for all similar architecture. 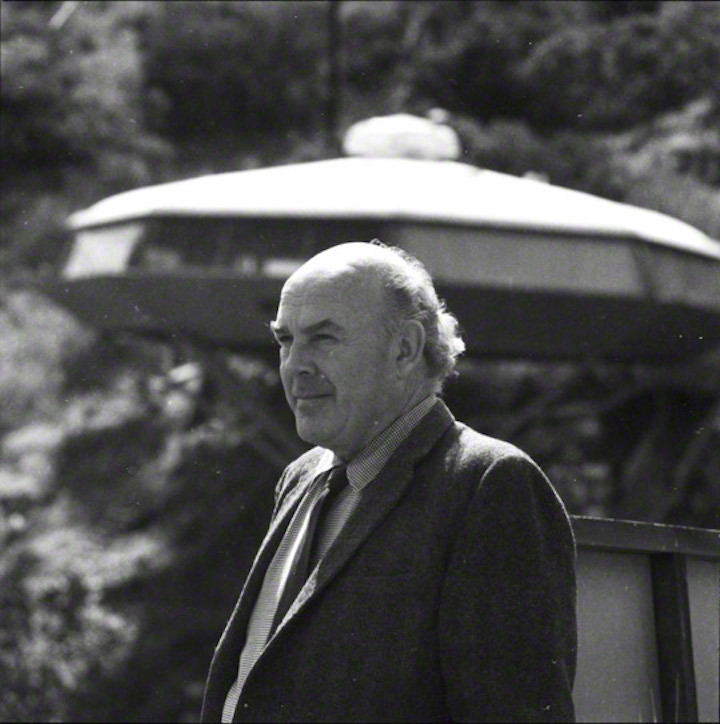 So – let’s thank him for Googie but remember him for more, much more. 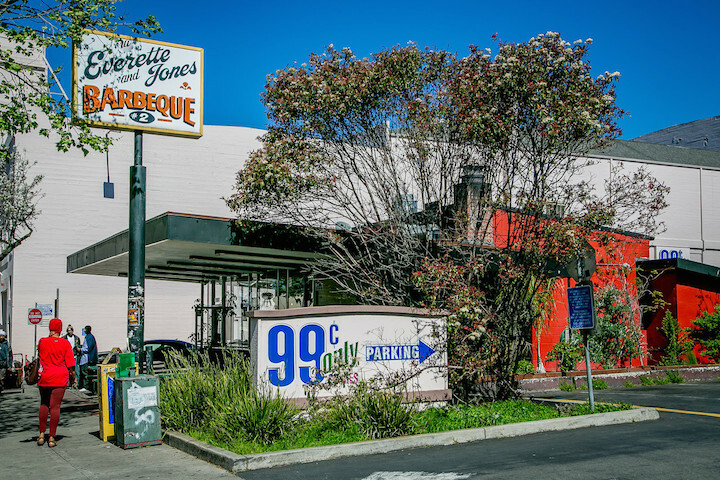 We don’t have a lot of Googie in Berkeley. Not far from us there are some great examples. 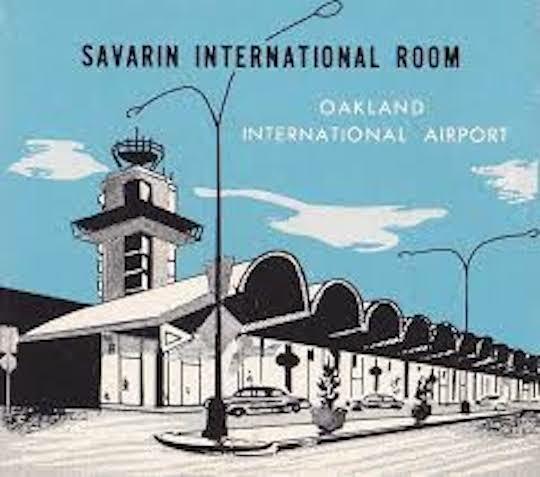 And closest to home – Oakland. 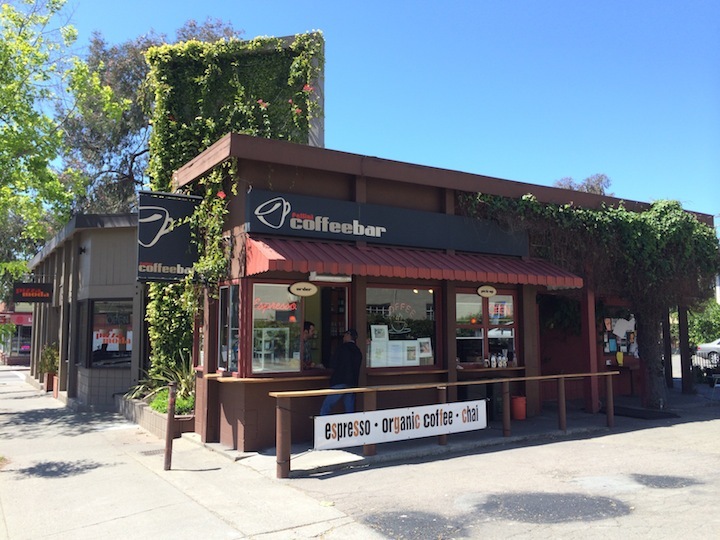 There is no better example of Goggie than the old Biff’s coffee shop on Telegraph. Wow! 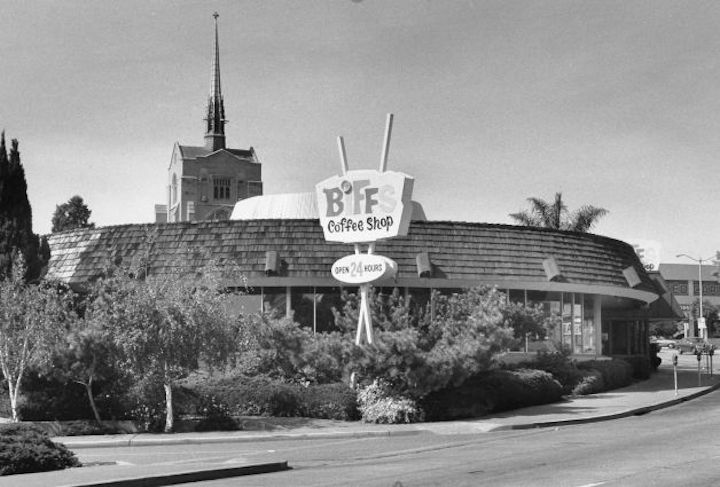 When I moved to Oakland in 1981 Biff’s was still limping along as J.J.’s. I went a time or two, but was partial to Dave’s Coffee Shop on Broadway for late-night apple pie and tea. 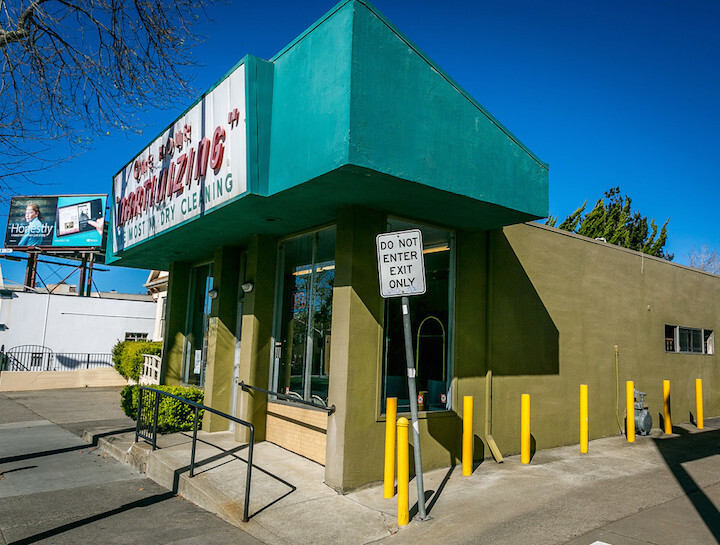 Not far from Biff’s, which escaped demolition but has not escaped neglect, is Giant Burger. It is hurting, but still alive. 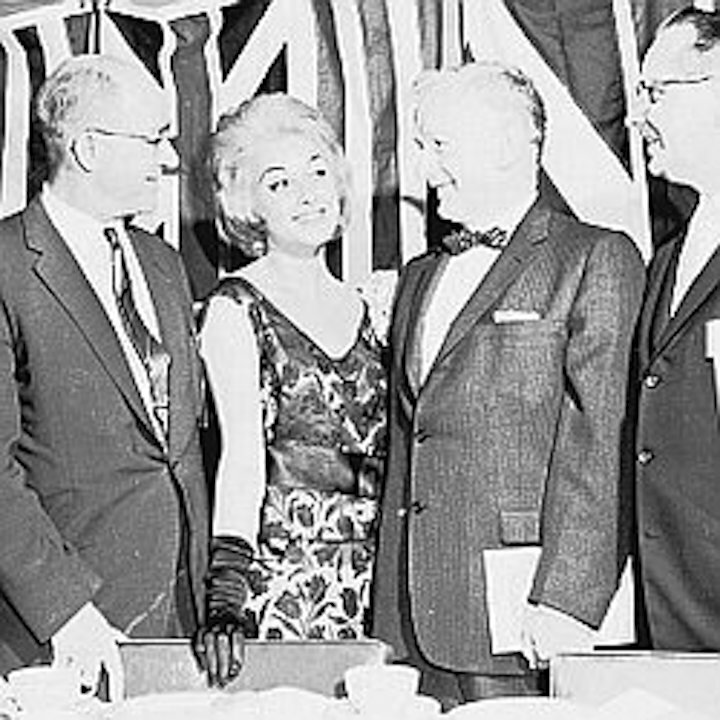 These three photos were made by Gerald Ratto in 1962. 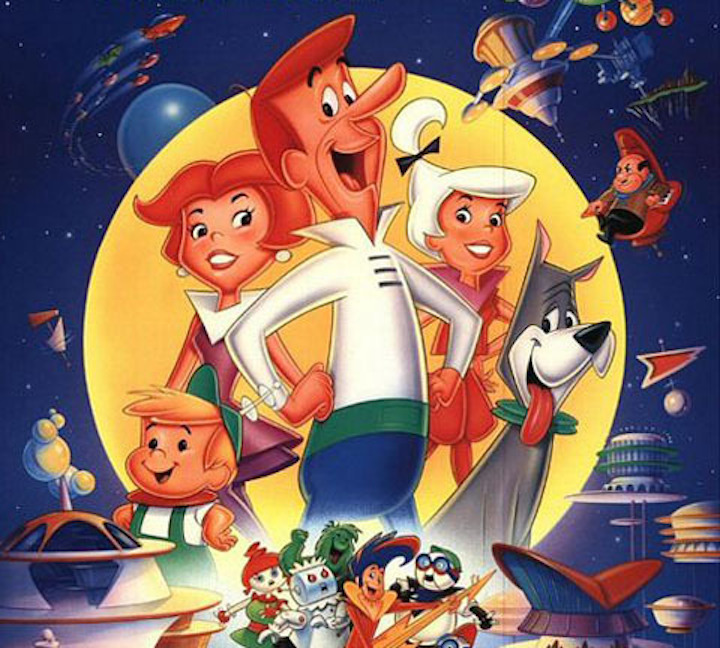 I hope to find higher quality copies to switch in, but there give the sense of Googie. At least I think they do. 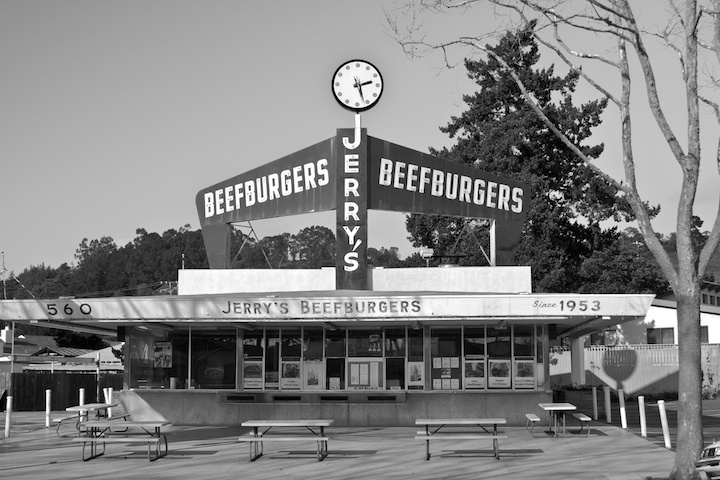 One last stop before Berkeley, and that is in San Leandro, at Jerry’s Beefburgers. 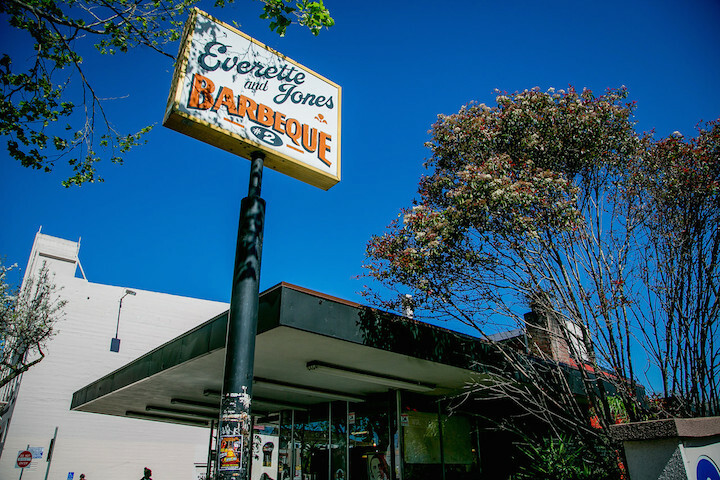 Okay – back to Berkeley. 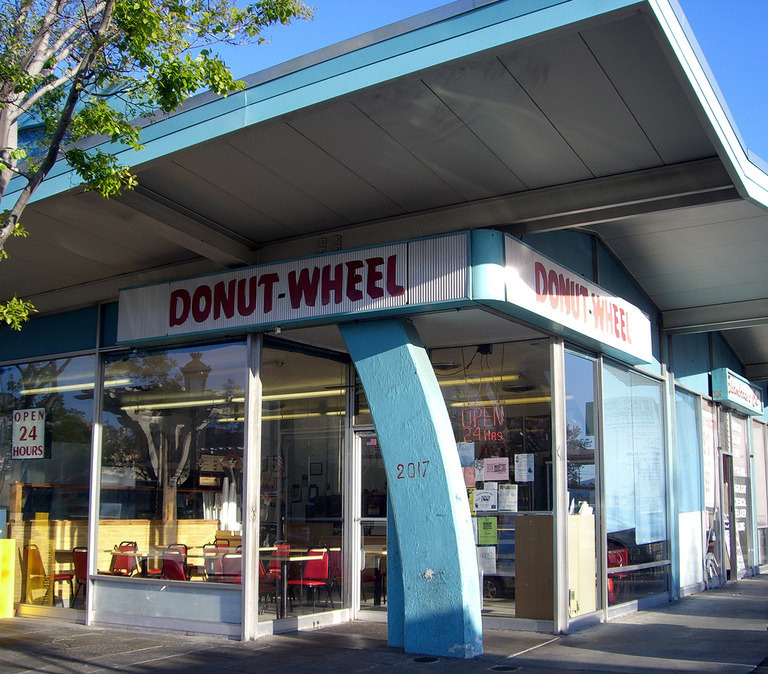 As I was saying, there is not a lot of Googie in Berkeley. If we are allowed to dip into the past, there once was a little more than we now have. Today it is the Super Eight. 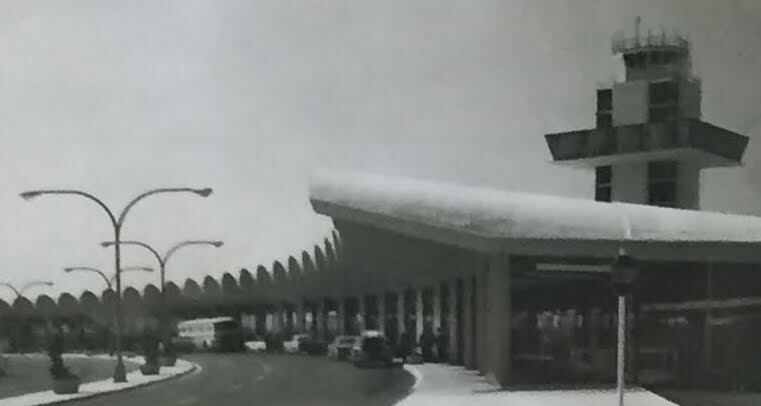 No hint of Googie. 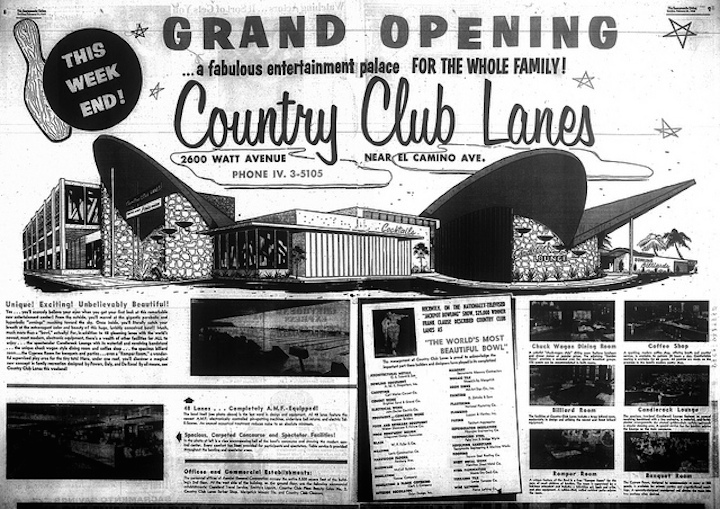 But even in our heyday, there wasn’t a lot of Googie. Were we too staid? Too sophisticated? 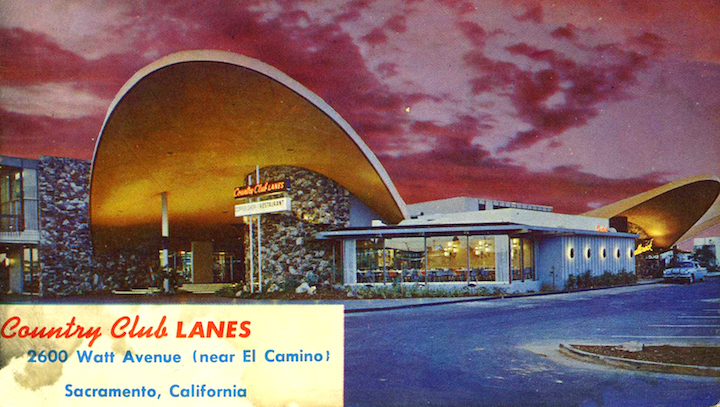 Too not immersed in car culture that seems to go hand-in-hand with Googie? 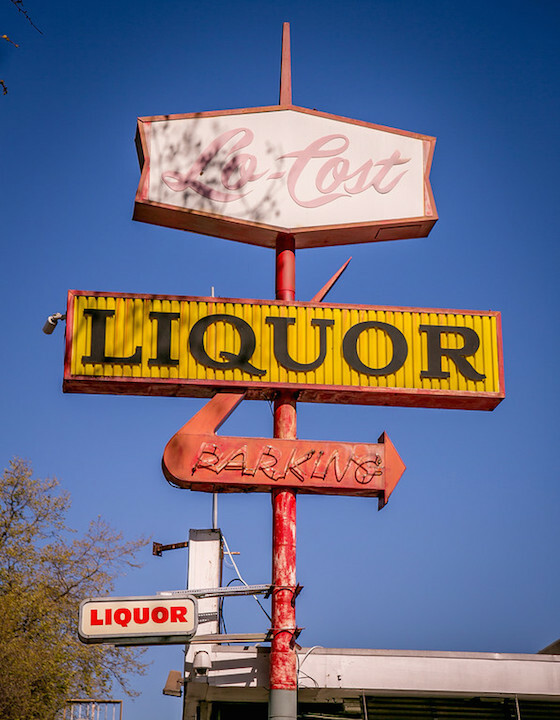 It is an admitted reach to come up with more than three or four solid examples, but I believe in them, and I will argue that there are Googie influences in others. 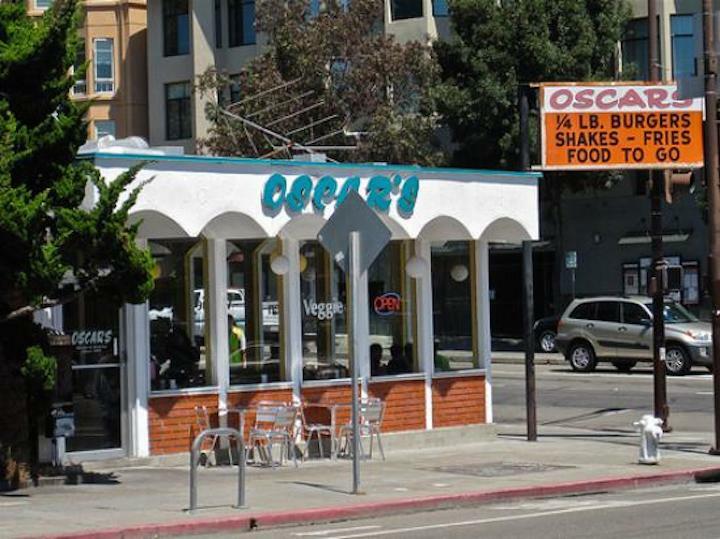 First prize (there are only three) goes to Oscar’s at 1890 Shattuck. It brings me a smile every time I drive by it. I eat there a few times a year. 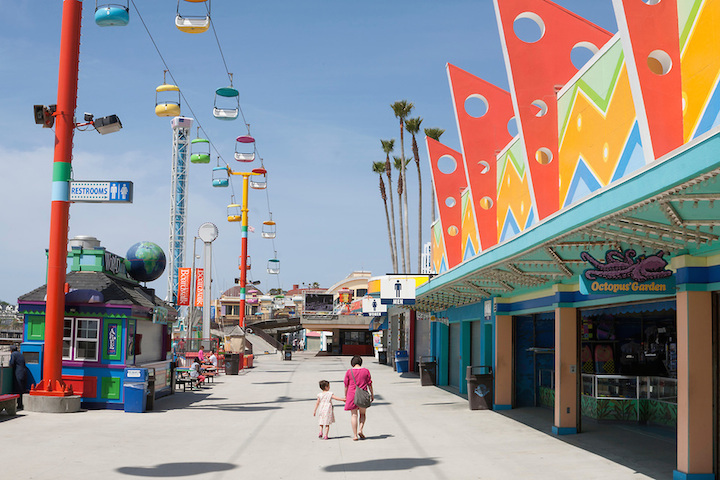 Pure Googie. 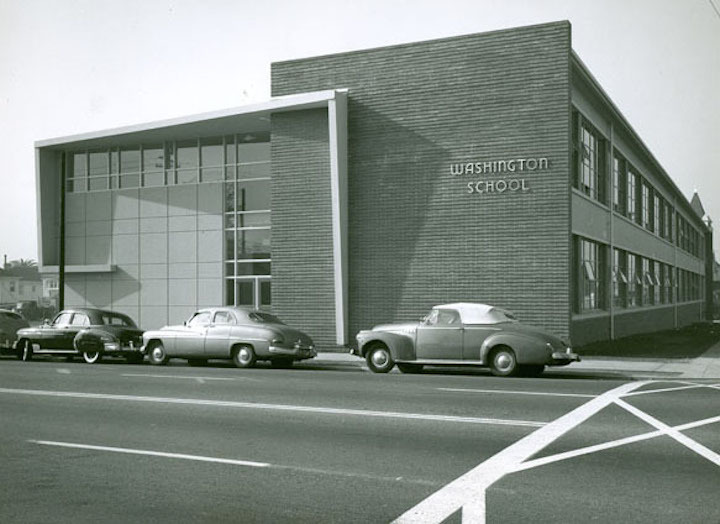 Built in 1950. Today it is Bacheeso’s restaurant. 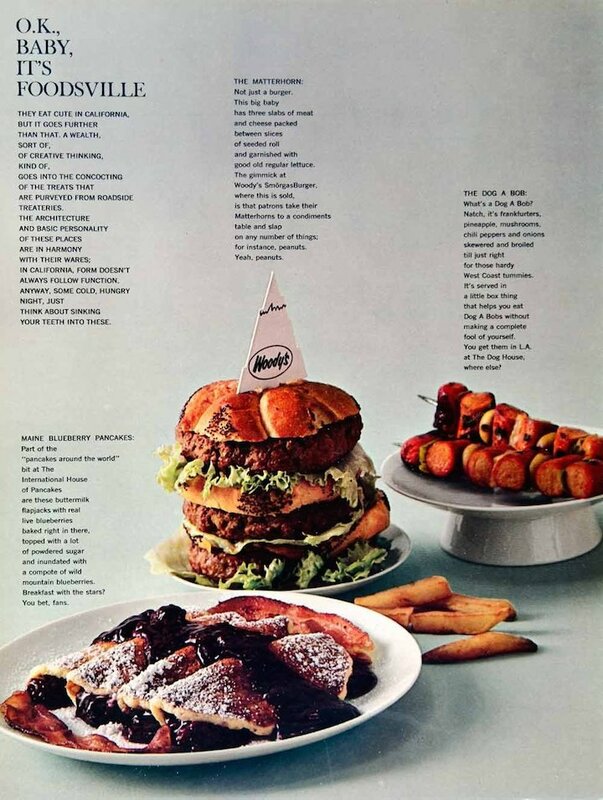 It has been many different restaurants. 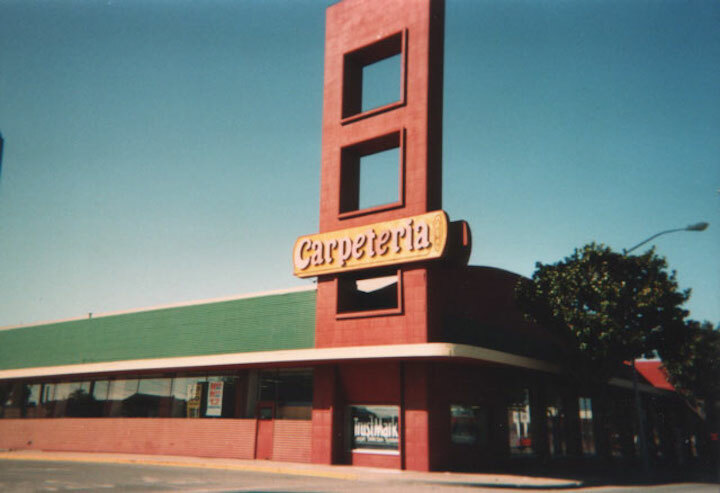 I always assumed that it had started life as an International House of Pancakes franchise, but that is wrong. 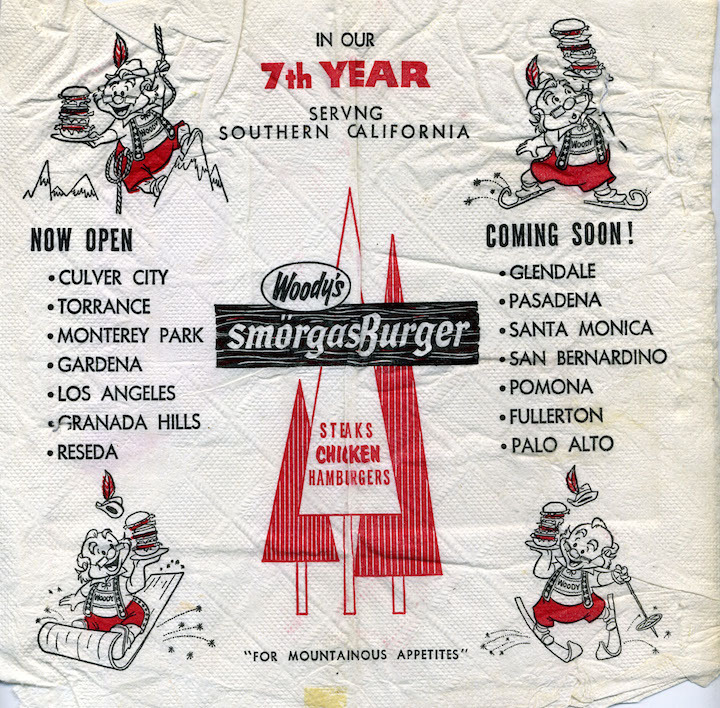 It started life as a Woody’s Smorgasburger. Say what? 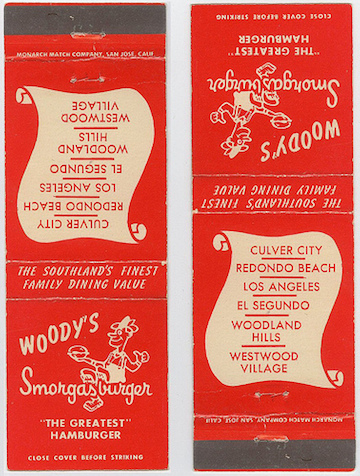 Woody’s was a small chain mostly in Southern California, but somewhat in the north. 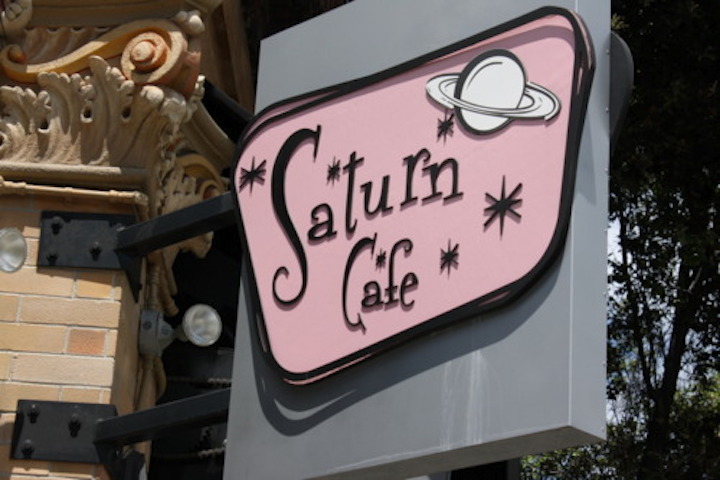 Their gimmicks included do-it-yourself condiment bars and build-it-yourself sundae stations. 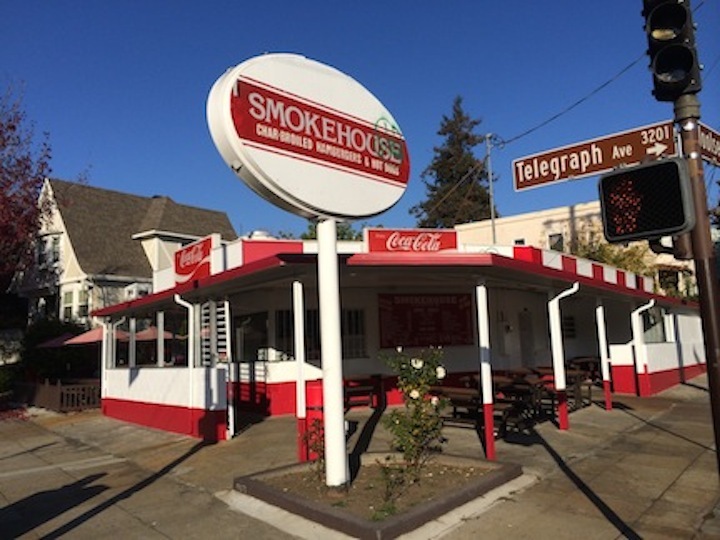 The restaurants were designed by Neil M. Johnson, a Los Angeles architect whose most famous work was probably the Steel House in the Los Feliz neighborhood of Los Angeles. 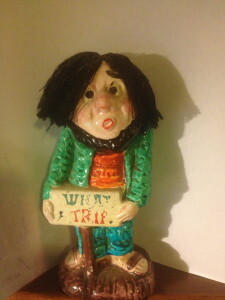 Just for the fun of it, here is a little Woody’s ephemera. 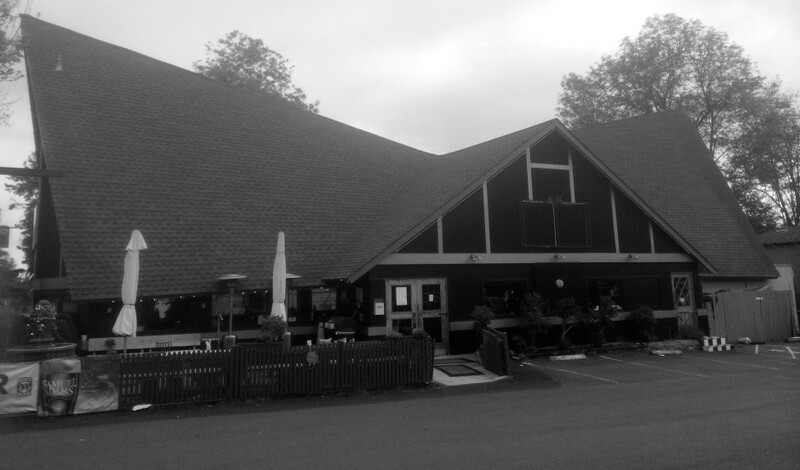 Photos of other former Woody’s may be found here. Well. Well. Let’s keep them in for the time being. Look at them. 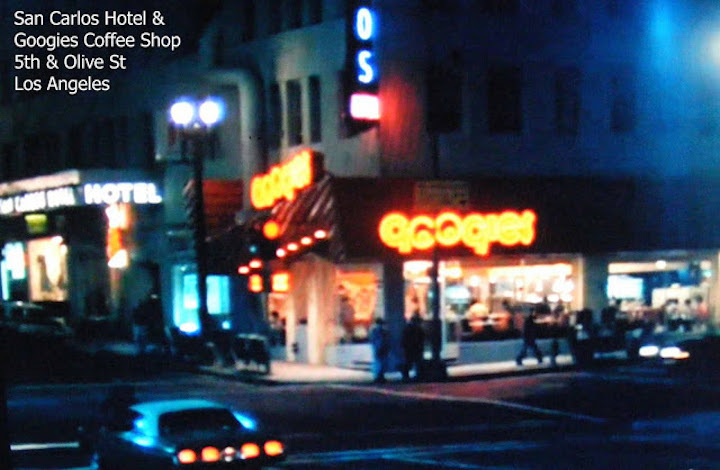 Having learned a little bit about Googie, look at things more carefully. 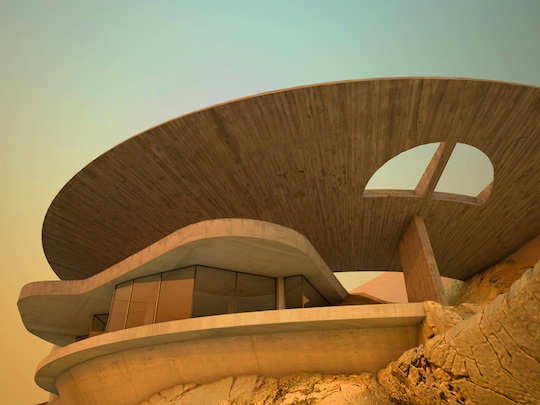 Visual acuity while exploring is never a bad thing. Charlotte’s first ice cream was a soft-serve chocolate cone from here. 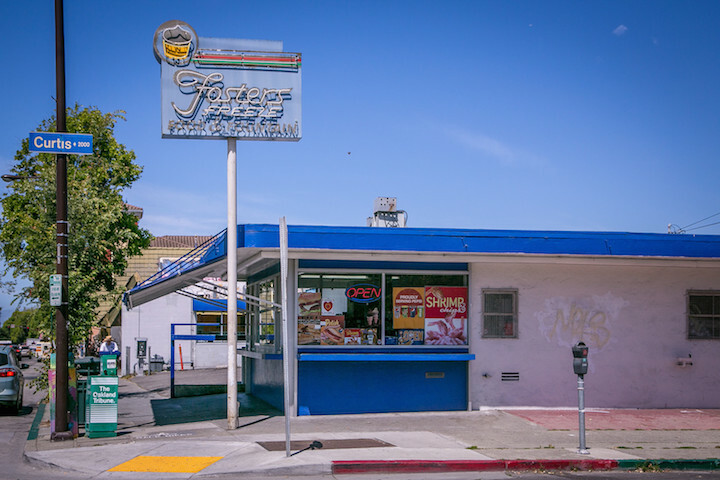 George Foster founded the Foster’s Freeze business in 1946 when the State would not let him open Dairy Queen franchises in California because of stringent dairy laws. Those who swear by Dairy Queen do not appreciate comparisons with Foster’s Freeze. 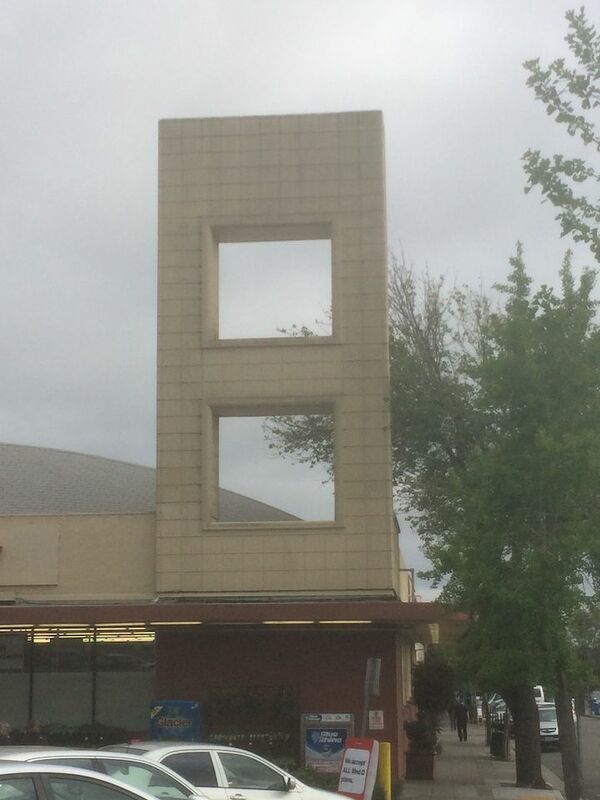 This was once a Sam’s Burgers. I hope to find a photo of it when it was. 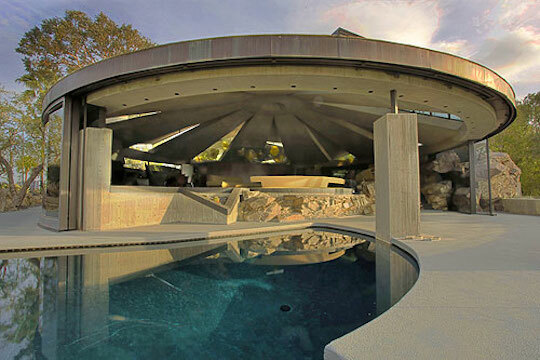 Maybe it looked more Googie. 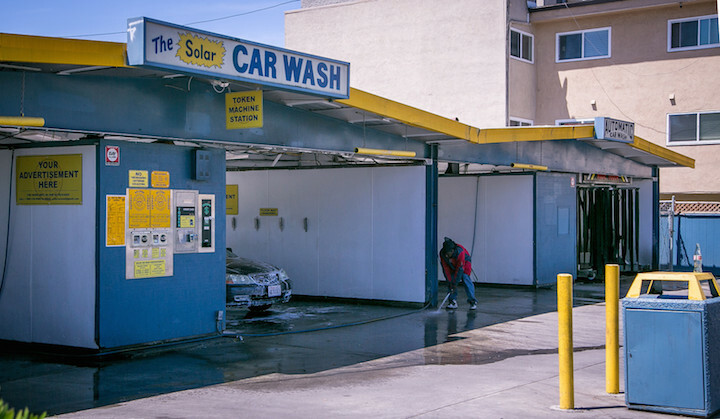 Just east of the Googie/Semi-Googie/Debased Modernist car wash is the temple Netivot Shalom. It used to be a Jay-Vee liquor store. 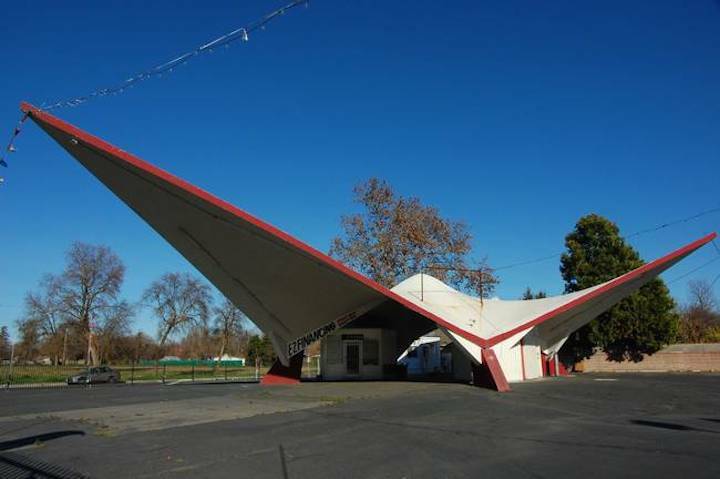 It was a good strong contender for Googie status. Here is the best photo I have found of Jay-Vee. 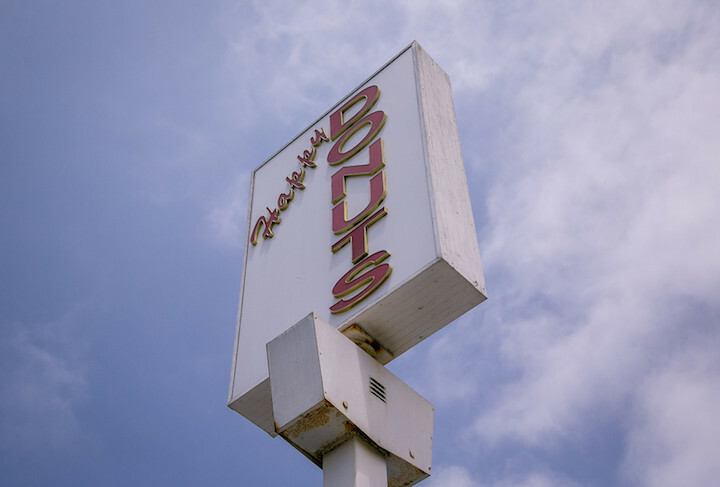 It had a killer definitely-Googie sign. I am working on that. 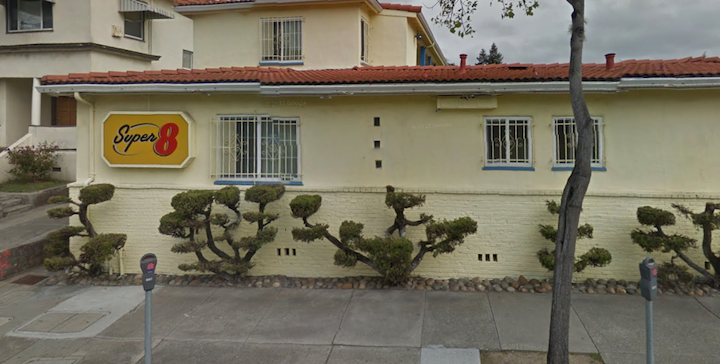 You can see the Googie, no? 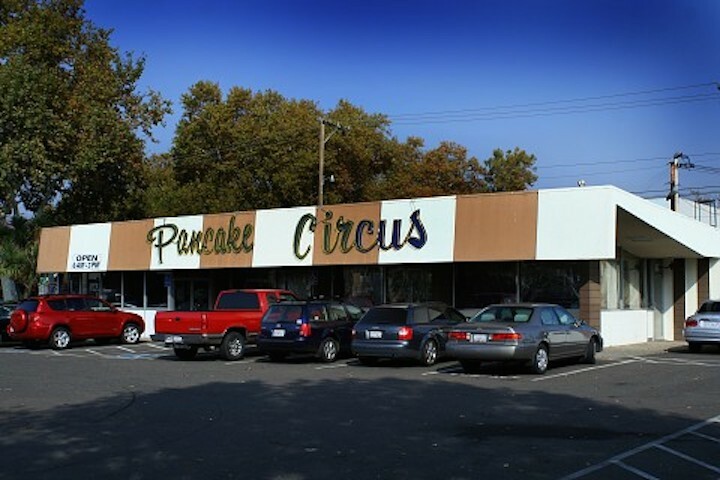 This building on San Pablo has gone through many lives – Willys dealer, liquor store, equipment rental, marijuana dispensary, and – empty. 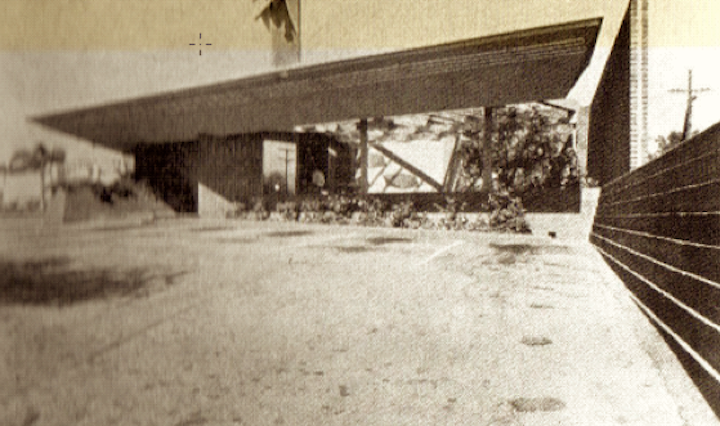 Daniella Thompson collected great old photos of the site and wrote in her expected thorough and definitive way about the building for BAHA. Let me throw myself on the mercy of the court on the next one. 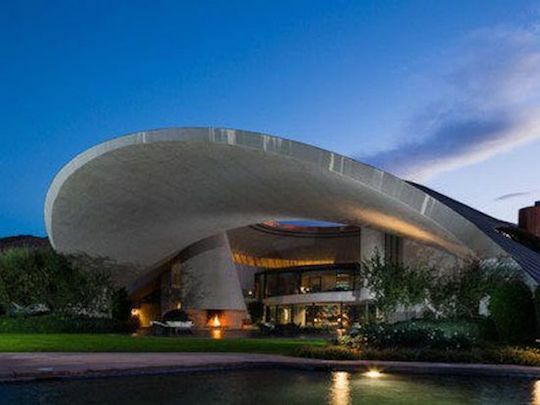 The final example of architecture that I am including here is not a great fit for Googie, but it fits better here than anywhere else. 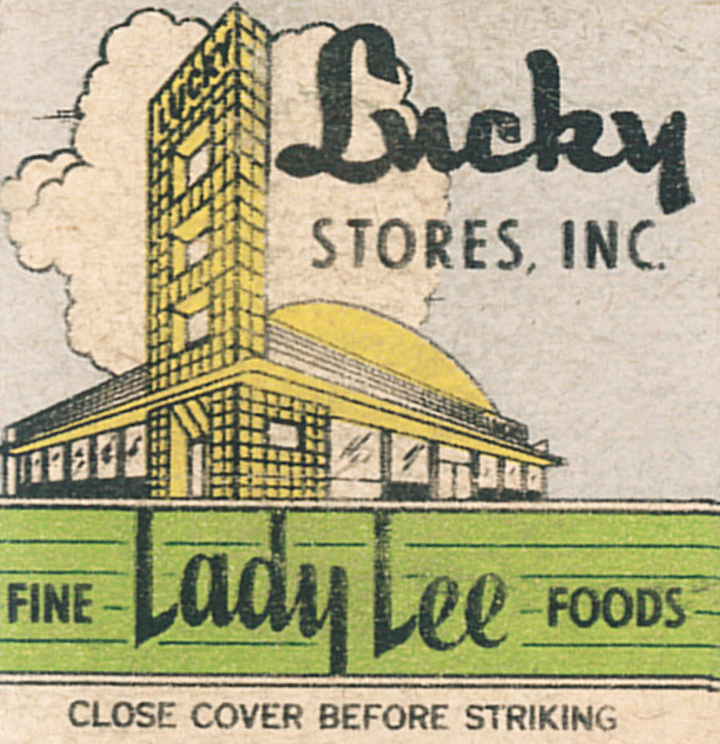 It is found at the CVS pharmacy on Stattuck and Rose – formerly Long’s Drugs, and before that Bill’s Drugs, and before that Lucky’s. 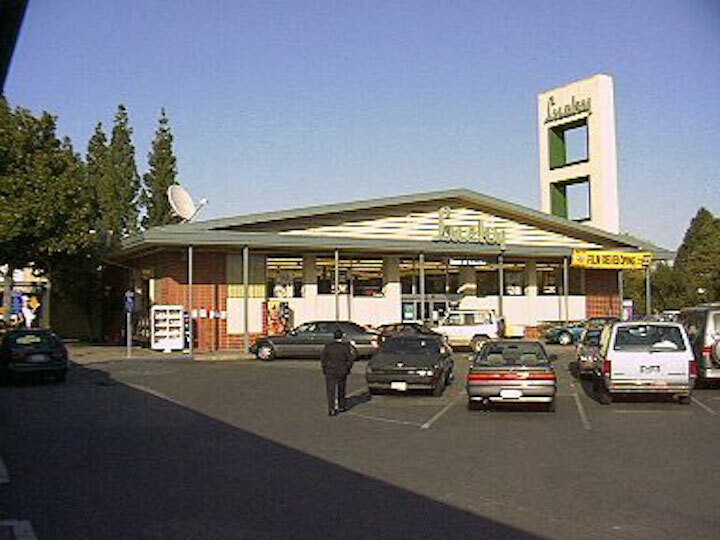 The supermarket was built in 1947 and opened in April, 1948. 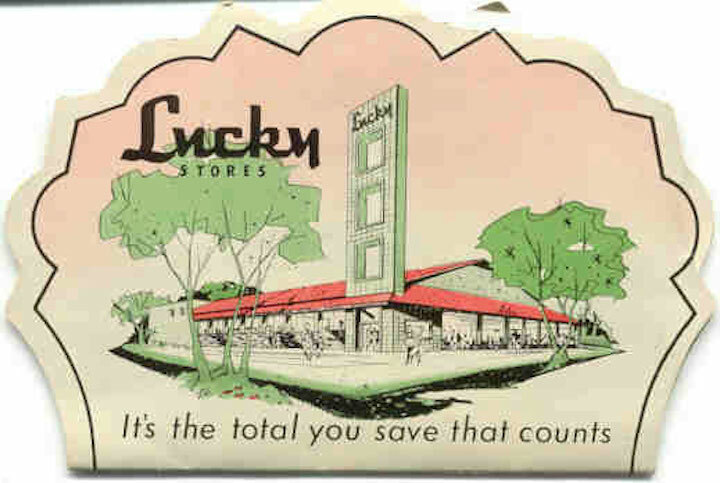 And not that it matters – between 1964 and 1967 Lucky’s operated the store under the name Bonanza. 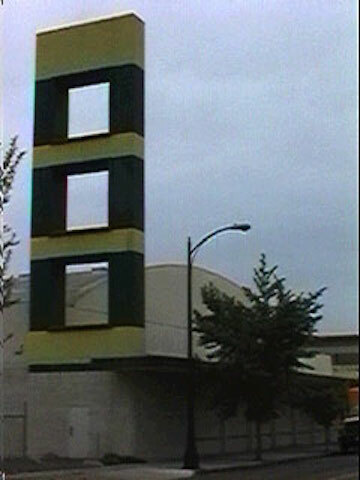 The two-square pylon tower is the signature piece here. 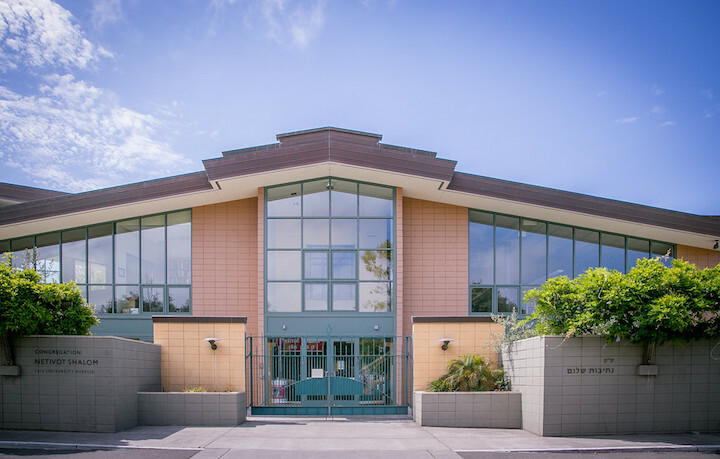 East Bay architect Paul Hammarberg adapted the Shattuck-Rose site to the Loewy archetype, reducing the number of squares from three to two. 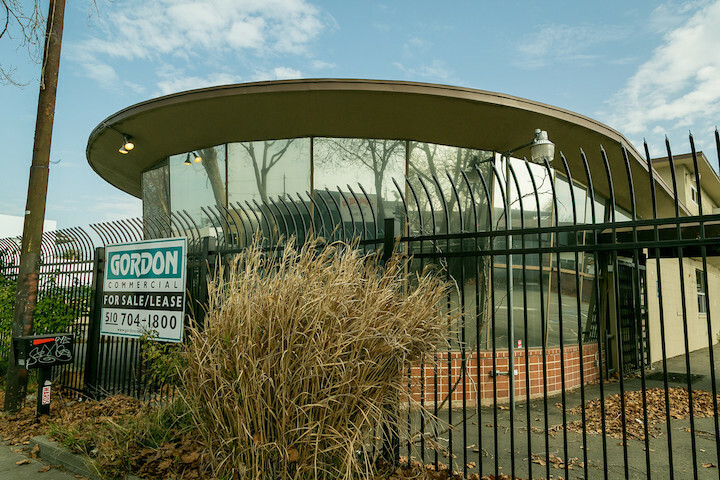 In the early 1980s, the city’s Landmarks Preservation Commission considered declaring the building a landmark. 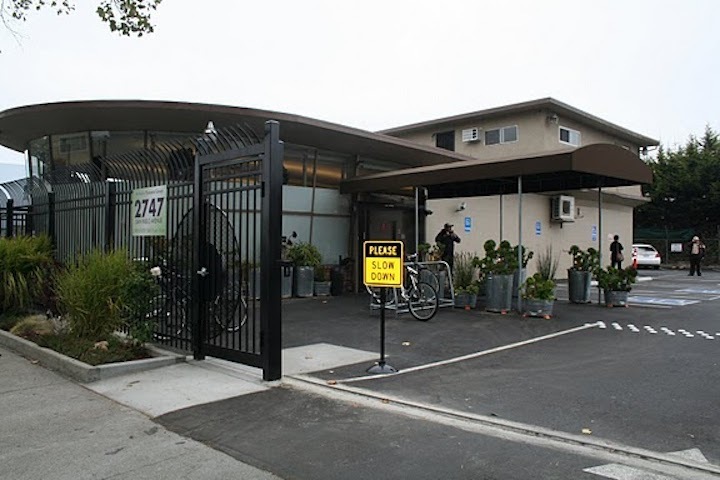 The application was rejected, and as a result several major changes were made; the yellow and green porcelain tiles on the exterior were painted over, and the large windows facing Shattuck were built over. 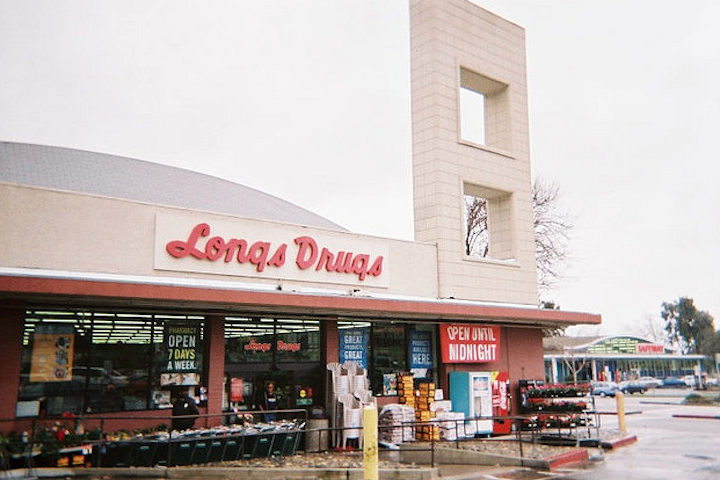 In 1998, Longs applied for permit to demolish the Shattuck and Rose tower down. 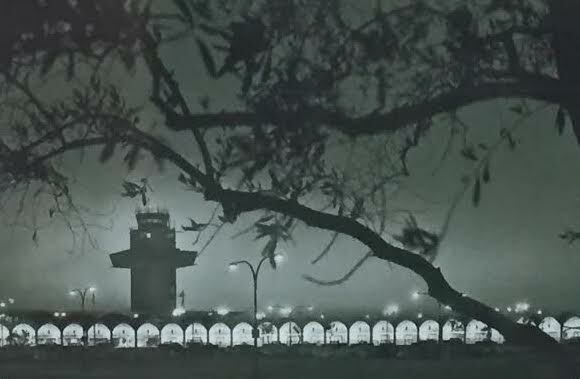 Permission was denied and the tower stands. 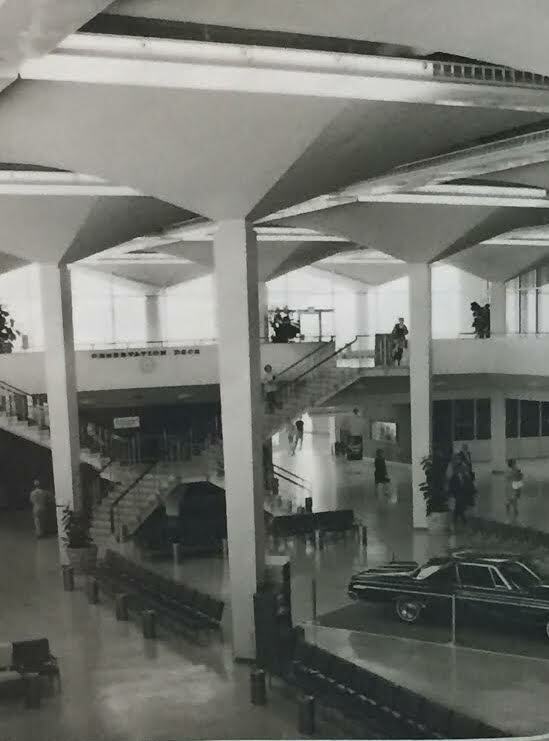 When I showed these photos to my friend, he remembered that our mutual friend Gabby had discovered the glory of Googie when he was in Philadelphia in 1970. 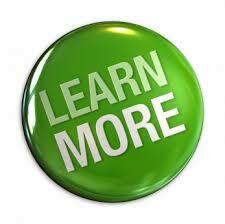 If I knew that, I had forgotten. Good for Gabby though. 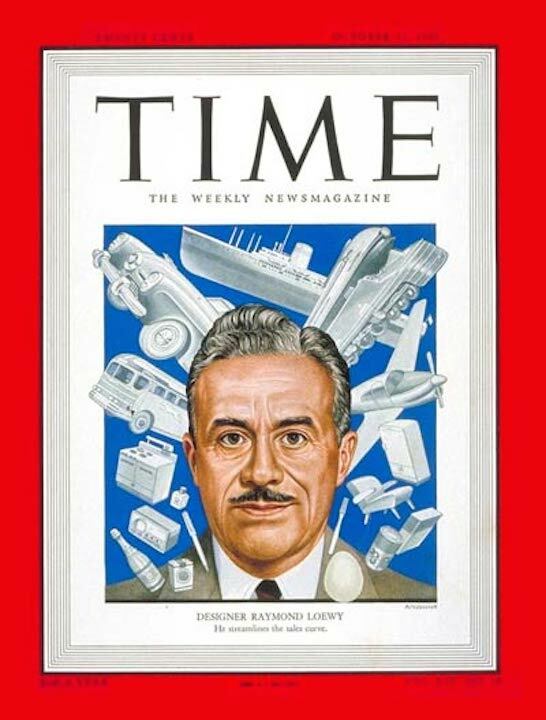 I think that in another lifetime he might have been an architect or historian of architecture. 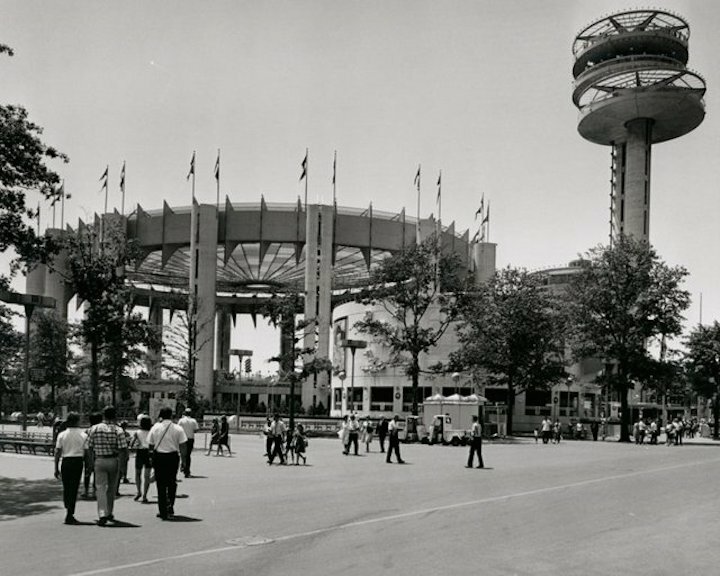 My friend asked me if I had not gone to the New York Worlds Fair in 1964. I said yes, that I had. I showed him the one photo that I still have that I took when I went with my friend Criswell – the head of the chapel vestry at my school 45 years ago – the summer after 8th grade. We took the train from Philadelphia to New York and got ourselves to the Worlds Fair and had fun and got ourselves home to Philadelphia. He was 14, I was 13. You wouldn’t see that so much these days! 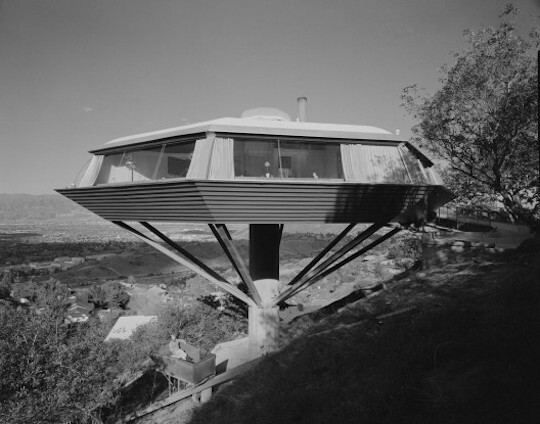 2 Responses to Architecture – Googie!!!! 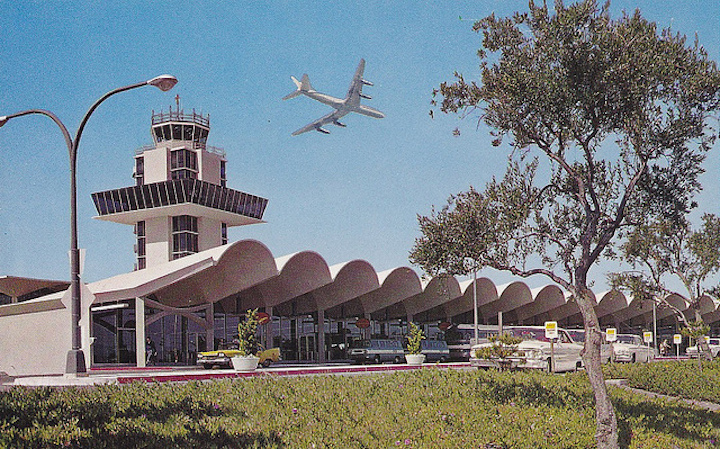 Or – Semi-Googie!!!! 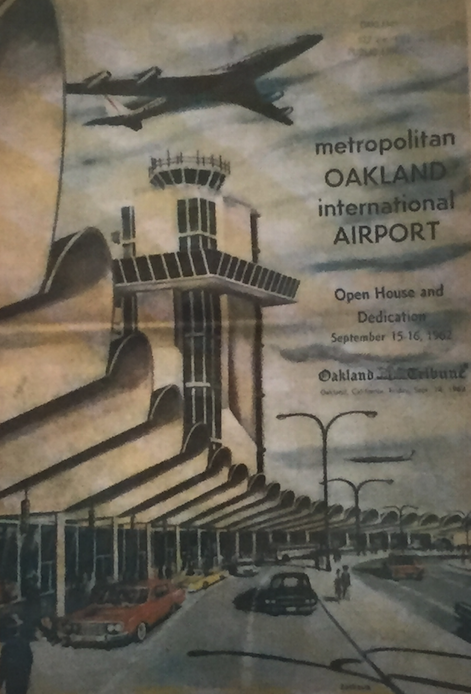 Just read your Googie piece. Very interesting! Saw you grew up in Philly? Bryn Mawr. Episcopal Academy Class of 1969. University of Pennsylvania Class of 1971. You?